The Witcher 3 is one of this console generation’s best games. It might even be one of the best role-playing games ever made. Maybe it shouldn’t come as a surprise then that Gwent, its side-quest distraction turned standalone card game, is every bit as detailed, complex, and beautifully crafted. There’s a card in the game called Alba Pikeman and every time someone plops it onto the board a soldier’s voice breathily says, “Mashed potatoes with thick gravy.” It doesn’t have anything to do with the card’s ability, which plays an additional Alba Pikeman from your deck after two turns and as far as I know it’s not a line spoken in any of the Witcher games themselves. The line is so specifically delivered, however, that after a few games it’s impossible to forget. Gwent has the difficult task of animating characters and events that most people aren’t very familiar with. Even if you’ve played any of the games, or read any of the books, it’s very possible you don’t remember who Iorveth is (the leader of an elven rebellion in the second game), let alone a character whose name is only spoken like Nenneke (mentioned offhandedly to be a renowned healer in the third). I’ve used the ladder more times than I can count, resurrecting cards to clinch a match in the final moments. 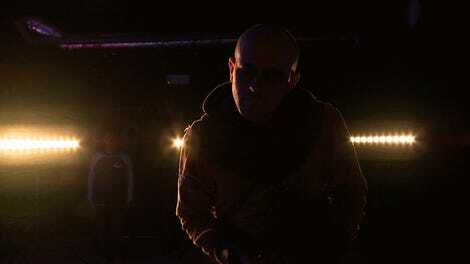 “Nasty wounds, those. But you’ll live,” she reassures me each time, until the card has taken on a role and identity beyond the simple quantitative way it functions in the game. Conditioned like lab mouse, her voice and the sound of my previously used cards fluttering back into my deck helps assuage my anxiety and prime me for the victory that so often accompanies playing her. And then there’s the Alba Pikeman, tasked with representing an entire class of fictitious, spear-toting Nilfgaardians. Maybe “Mashed potatoes with thick gravy” is him remarking on what he had for dinner the day prior, or fondly remembering a meal he used to share with his family before being shipped off to war. More cynically, it could be an allusion to lumpy corpses bleeding out that he leaves in his wake. Like the game that spawned Gwent, the line is masterfully voice-acted and pleasantly ambiguous. It helps elevate a visually nondescript and not altogether mechanically interesting card into something more than just a number standing in my way. At its most basic, Gwent is like the card game War. Players take turns going back and forth putting down cards with the object being to score the most points by playing cards of greater value than the opponent. From there, things get complicated. 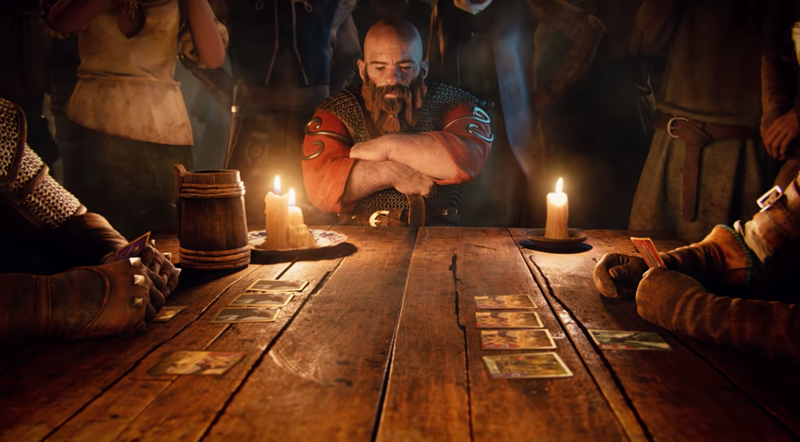 In War, cards are played randomly, while in Gwent, each person has full view of their hand and gets to choose how they will respond to whatever was put down last. There are also three distinct rounds, with each player allowed to pass at any time and stop playing cards for the duration of of one. When both players have passed, the round comes to an end and whoever has more points wins. Once a player has won two of the three rounds, the game is over. From there the analogy gets strained to the limits of its usefulness. In War, every card has a single value. Eights are eights and sevens are sevens while Queens are higher than Jacks, and so on. But in Gwent, as in games like Magic: The Gathering and Hearthstone, cards have special types and abilities in addition to their numbers, which is where the complexity and potential for endless improvisation comes in. And of course there are cards without numbers like spells and potions that augment whatever’s already on the board with one-time effects. That’s where things get interesting, and for some, overwhelming. In The Witcher 3, one of Gwent’s strengths was its mostly straightforward strategic trade-offs. You could try to overwhelm the AI opponent with early force, stall with spy cards for a late game advantage, or bait them into fully committing to a round before pummeling them with bad weather. As a stand-alone game, Gwent is drastically different. There are hundreds more cards with finely-tuned synergies and, most importantly, human opponents. Kotaku’s Kirk Hamilton wrote about his experience getting to know the intricacies of Gwent last fall. Bottom line: it takes some getting used to but over time channels everything that made The Witcher 3's minigame so addictive in the first place. Your card armies are arranged in three different rows, with the option to pass at any time always threatening to throw the best laid plans into complete disarray. There’s nothing better than disrupting an opponent’s multi-turn combo by withdrawing from a round early and conceding it in order to gain a one or two card advantage going into the next. There’s also a strange satisfaction in watching a card like Alba Pikeman be the one to cover the retreat, multiplying its ranks and thinning your deck in the process just so you can strategically lose. It’s easy to miss Aldert Geert. Sitting in an inn minding his own business at the beginning of the game, you have to go out of your way to talk to him and nothing in his manner or dress invites you to do so. But take a second to say hello while passing by, and he’ll invite you to play a round of Gwent with him. It’s the first time The Witcher 3 introduces the card game to the player, and it’s a perfect encapsulation of what makes the overall game so compelling and also how Gwent seems to fit so seamlessly into it. Regardless of which you choose, you’ll proceed to play Aldert in a match that features the game at its most basic. If you win he’ll give you a special card from his collection, the first of many you can collect throughout the rest of the game. But I didn’t actually play my first match of Gwent against Aldert. In fact, I missed him altogether while in White Orchard. The first time I met Aldert he was hanging from a tree at a fork in the road near Velen. I must have picked up the book he was working on without knowing who it belonged to because I spent the rest of the game with Zoltan Chivay in my deck. The card drops out of his unfinished tome when you flip through the pages, the same one he would have given you if you’d beaten him back in White Orchard. Forever after then, the card becomes linked the way his lifeless body sways in the wind and with that Gwent stops being just a mini-game and instead becomes another vector for conveying the game’s grizzly pessimism. Where some games go to great lengths to shine a spotlight on what’s important and what’s not, The Witcher 3 has garnered so much acclaim since it came out in part for its refusal to force those clear delineations on the player. The lines between good and bad constantly shift and bend. Some small quests are epic and emotional while some large ones are quite ordinary and pedestrian. Outside of a vague through line only captured in one of the game’s menus, there’s simply a bunch of economically written characters getting on with their pre-programmed lives as best they can. Like Aldert. The Witcher 3 is filled with interesting but easy to miss characters like this and playing cards is one way of finding and interacting with them. A nameless bar keeper in Velen or a tailor on the island of Ard Skellig, each is given a chance to speak a few lines and share the brief intimations of their story over a few rounds of cards. It’s amazing how NPCs come to life when you’re doing something other than just asking them for directions, and nobody’s too important or too busy for a few rounds. Kings and brothel owners alike will indulge you in a game if you take the time to ask, and like the cards they’re playing, neither, in The Witcher 3's world at least, are any freer from the slow, brutal plodding of forces beyond their control. Gwent fans might bulk at my earlier comparison to War, but the similarities are in the game’s rhythms and in the granular shifts in momentum that accrue round after round to deliver secure wins. And Wars name isn’t a coincidence. The purely random arithmetic that drives its action is of a piece with military conflict not because actual wars are neutral affairs without good guys and bad guys, but because like actual wars the machine will continue grinding while its victims are powerless to halt it. It’s a tragic philosophy that stalks The Witcher 3 at every turn and one Gwent has successfully adopted in both form and function. For all of its strategic depth and myriad deck archetypes, what’s most impressive about Gwent, is how it’s managed to recreate the very human quirks and general, ineffable mood of the landmark game that preceded it.